Bay and bow windows are popular, attractive additions to any home. Bay and bow windows are a combination of windows that project outward from the home. A bay window is a 3-panel projection window with fixed picture window in the center with either fixed, double-hung or casement windows on both sides. A bow window is made up of 4-6 windows in the shape of an arc and a small insulated seat with fixed center windows and casement windows on the ends. 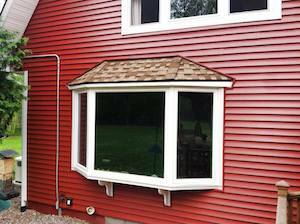 Marshall Exteriors specializes in replacement windows that are designed and manufactured to last. We can install vinyl and fiberglass bay/bow windows, which will provide you with the beauty and functionality you need. Our professionals are happy to replace old bay and bow windows with a newer, more efficient unit. We provide Free Estimates to help you get started on finding which type of bay/bow window is right for you. If you're looking for expert window replacement, contact us today! We proudly serve Canandaigua, Fairport, Newark, Geneva, Victor, Ontario, Seneca Falls, Waterloo, Farmington, Macedon and many areas of New York.